One nice thing about digital cameras is you can easily change from color to black and white, either in camera of afterwards during post processing. 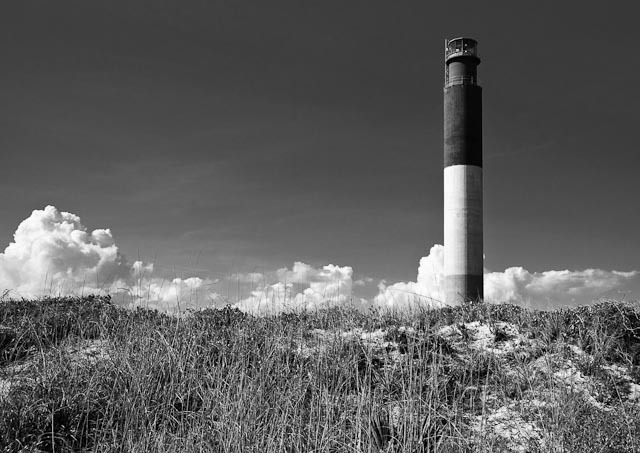 When you have a situation such as this one, taken at the Oak Island, NC Coast Guard Station lighthouse, with a summer storm on the back horizon, and dune vegetation in the foreground, going to black and white makes everything really stand out, especially the lighthouse against a darkened sky, which in color was a very dark blue. I need to post more “summertime” photos to make me think warm this winter!